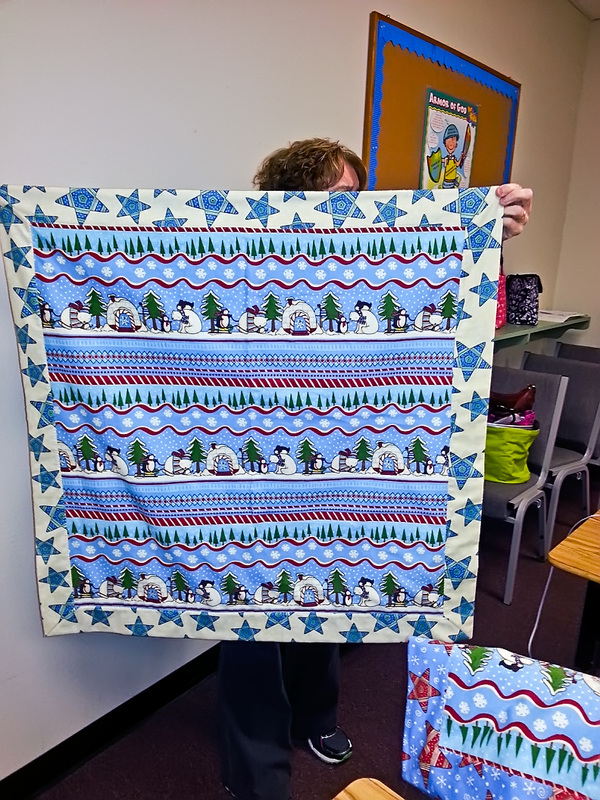 Sixty quilters, including 26 guests, joined for an evening of inspiration at the latest Common Threads Guild meeting. What's New on the Common Threads Web Site ? Next Saturday Sewcial - May 18 13 - Road trip to Southeastern Quilt and textile Museum. See below for more information. Block of the Month details here! 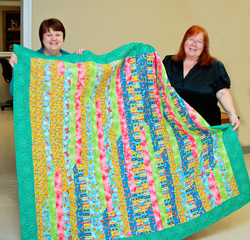 Dora Hayes ( right),member of the Coweta County Employees Relay for Life Team, accepts a quilt from Jo Glass of the Common Threads Quilters Guild. The Quilt, pieced by Susan Boyd and quilted by Gail Lane, will be raffled for the benefit of the Relay for Life fundraiser. Tickets will be available during the event at the County Fairgrounds on Pine Road Friday evening April 26.The Common Threads Quilt Guild embraces a number of charitable and compassionate out reach efforts, and this is the second quilt that has been donated to the Coweta County relay team this year. Spring has finally arrived, so that means "Road Trip"! Come join us for a trip to the Southeastern Quilt and Textile Museum, in Carrollton on May 18th, 2013. The Cherokee Crazy Quilters will have quilts on display. Admission is $ 3.00 per person. There is discount rate if there is more than ten people in a group of $ 2.70 each. Ater touring the museum we will have lunch and look around at shops if there is time. The quilt store has closed that was there. We can set up a car pool if anyone is interested. Lots of Show and Tell pictures from older meetings, click here! We try to keep as many as we can for reference, but have space limitations.